Must be High school graduate; Physically fit, Honest and hardworking; Can carry heavy things. At least 5’4” in height; At least College level; With relevant work experience as a Cashier; Knowledgeable in using POS and Credit Card Machine; Physically and mentally fit; Can work under pressure; With pleasing personality and good grooming / hygiene. Male; At least High school graduate; Physically and mentally fit; With pleasant personality and good grooming / hygiene; Can work under pressure. 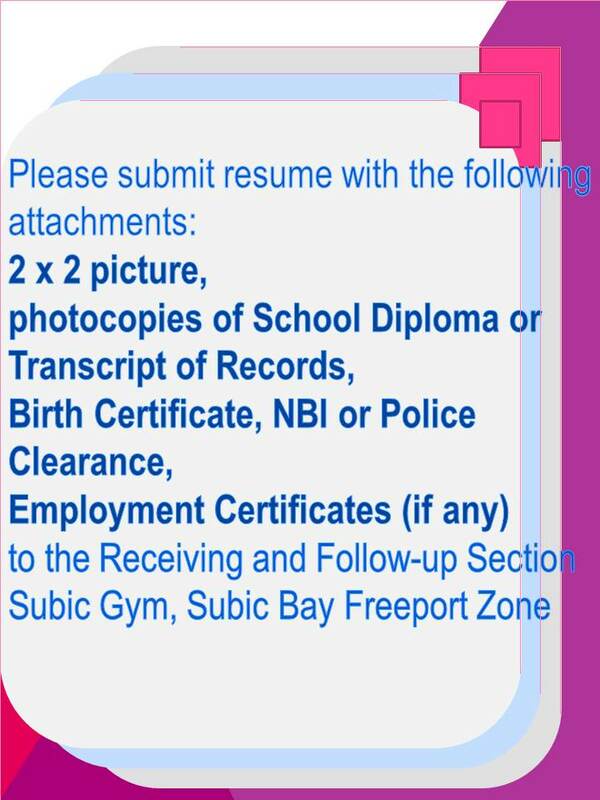 Female; College graduate of related course; With at least 2 years of relevant work experience in Food Industry; Must have knowledge in operating POS and Credit Card Machine; Physically and mentally fit; with pleasing personality and has good customer service and problem solving skills; Can work under pressure and has excellent work ethics; Without any visible tattoo/s. Male / Female; At least 5’4” in height; At least College level; At least with a relevant work experience as Food Server; Excellent verbal communication is a plus; With no visible tattoo/s and has good grooming / hygiene; With work on a shifting schedule; Can work under pressure; With pleasing personality and has good customer service. Male / Female; At least College level; With relevant work experience as Kitchen Helper; With no visible tattoo; With excellent work ethics; Physically and mentally fit and has good hygiene; Can work under pressure. Female; At least College level; Computer literate; At least with relevant work experience as Inventory Clerk; Must be knowledgeable in inventory control and stock system; Must be keen with details; Without any visible tattoo/s and has good grooming / hygiene; With excellent work ethics; Physically and mentally fit; Can work under pressure; With pleasing personality and has good customer service. Male; At least 5’4” in height; At least College level; Must have knowledge in mixing juices, coffee shakes and other cocktails beverage; At least with a relevant work experience as Barista; Without any visible tattoos; With excellent work ethics; Physically and mentally fit; Can work under pressure. BS Accountancy graduate; Must have strong work ethics, communication and analytical skills; Ability to work under pressure. At least High school graduate; Physically and mentally fit to work; Can easily take instructions. Fluent in spoken and written in English; With good moral character; Physically and mentally fit; Can perform basic mathematical computation; Willing to do field works; Willing to work long days and overtime. Male; With pleasing personality; Bachelor’s Degree, Preferably Mass communication or Marketing course; Good communication and interpersonal skills are critical for the job; Knowledgeable in business correspondence; Can work with minimal supervision; Analytical, detail oriented and fast learner; Knowledgeable in MS Office (Excel, Word, PowerPoint, Outlook and Access); Flexible, Patient, Trustworthy; Possession of valid Professional Driver’s License. Male; With 5 years’ experience as Electrician.